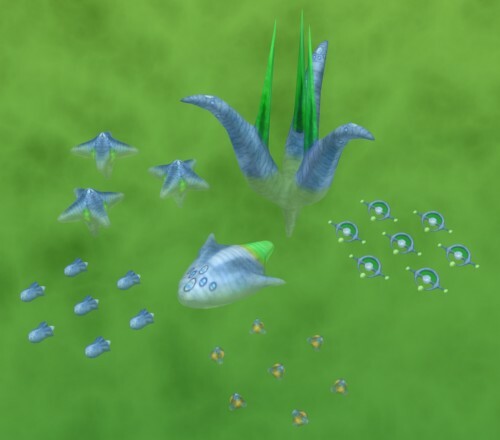 The image above shows a series of unit models for an alien race energy based creatures. All models were created using 3DSMax 6, textured using Paint Shop Pro 7, and then combined together in this scene with some dynamic fog. The models are part of a large set of graphics including various space ships and space stations intended for a game. The image above features satellites (left), a weapons platform, a drone (middle), ground troops (bottom left), fighter craft (right) and mines (bottom). The green fog is meant to represent existance in a gas giant, such as Jupiter (but green, of course). The glow, present on the space ships (see below) was not used for this image, it did not feel as appropriate. Secondly, the game they were intended for does not support such advanced glow effects, so trying to use them could be considered a bit fruitless.